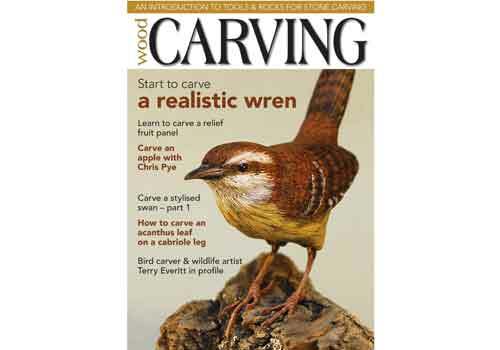 Issue 139 of Woodcarving magazine is filled with a host of great articles for you. We have the first part of Andrew Thomas' elegant Swan carving; Chris Pye carves an apple from a piece of lime; Steve Bisco shows us how to turn rough rock into stone carvings; new author Donna Menke explains how to carve a small bird in wood, with just a few hand tools; and continuing with his beginners' series, John Vardon shows you how to carve a fruit panel. All these and more in our 'Projects' section. In 'Features' we spend 20 minutes with Italian woodcarver Angelo Ponticelli; we profile Terry Everitt, an artist who specialises in wildlife paintings and woodcarving; Rosaleen O'Callaghan tells us about the Colmcille wood sculpture project, and we look at the Duomo di Milano, a cathedral that stands at the heart of Milan. We have some great 'Techniques' articles for you, such as Iain Whittington carving a simple end pattern, which is perfect for bracket repairs or crown cupboard mouldings, or can be adapted to suit; Dennis Zongker completes the cabriole leg with a carving of an acanthus leaf; Peter Benson shares his expert top tips and techniques for carving animals and human figures - great advice to heed before you start out. In 'Kit & Tools' Steve Bisco puts a 12-piece stone carving set from Auriou through its paces. We also have our usual 'Tests' section, with the Carver's Toolbag, and our 'Community' pages, featuring from the Editor, club profile and a peek at our next issue. All this and more in Woodcarving issue 139! You can also download a digital copy of the magazine to your iPhone, iPad or Android device and save up to 42%. Click here for further details.